The first thing you touch and see when you approach your coach is the entry door so the door sets the stage for all the future experiences you will have with your coach. 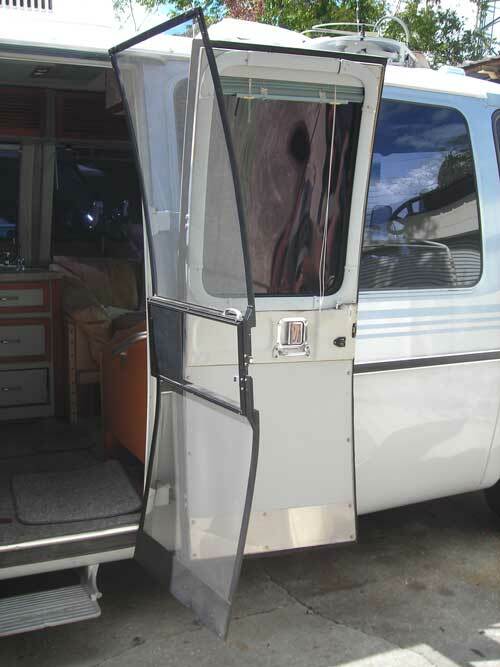 If the door fits well, looks good and is easy to get in and out of the coach through you have a better chance of enjoying your coach. If the foor whistles going down the road, leaks water when it rains is a *&^%$ to open or close or simply looks really old and messed up— well, you get my drift. Ok, to that end, here are some hopefully helpful tips on issues having to do with renewing the entry door both mechanically and cosmetically. We’re working with Tom’s coach, really nice machine, one that is frequently used and one we are spending a great deal of effort in refinishing and refining the interior of so follow our approach at bringing his entry door to the standard of his new interior. 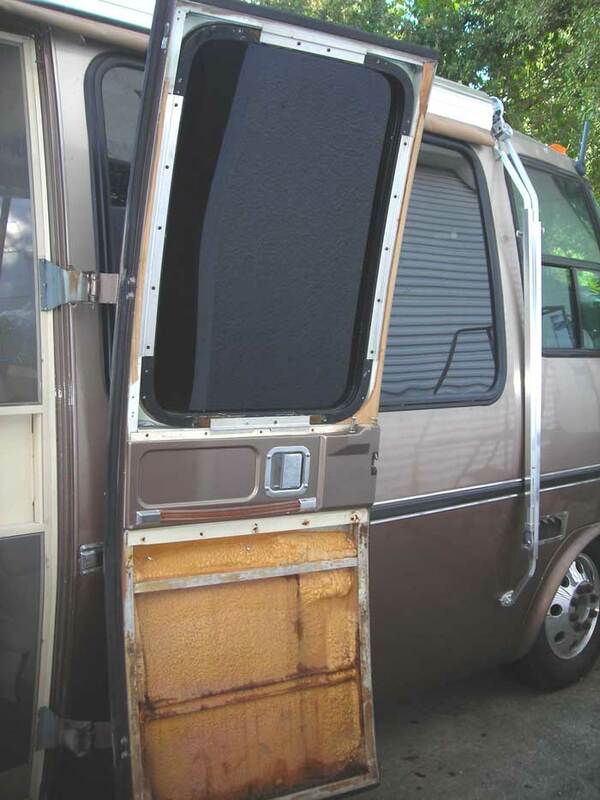 First of all, Tom’s door does not look that bad– from 10 feet away I mean it’s not water damaged, rotted away or any of that but with the interior of Tom’s coach looking new and fresh, the door needs to be brought up to the new standard. 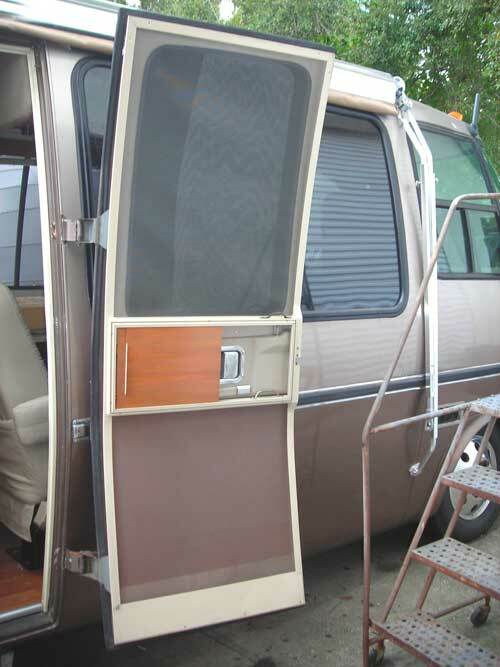 Tom has one of the original “Birch” screen doors which while being a great feature complicates both the entry door cosmetics and operation as well as the fit Upon closer inspection, the main latch panel was painted the exterior color before and did not look bad but… the original strap stitching had deteriorated and its finish did not match anything in the coach. The paint on the panel had spots missed and along with the old woodgrain trim panel it was obvious something had to be done. 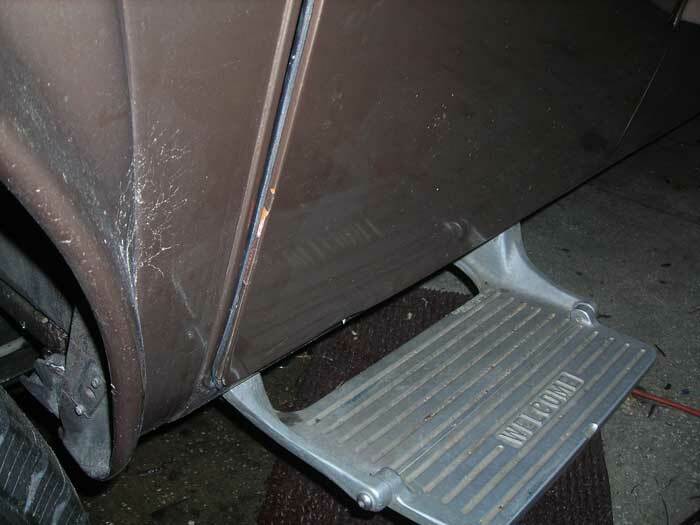 Coupled with the cosmetic issues, there was a fit issue, the door was not closing tightly , the bottom of the door was standing out from the body while to op was pretty much in line. 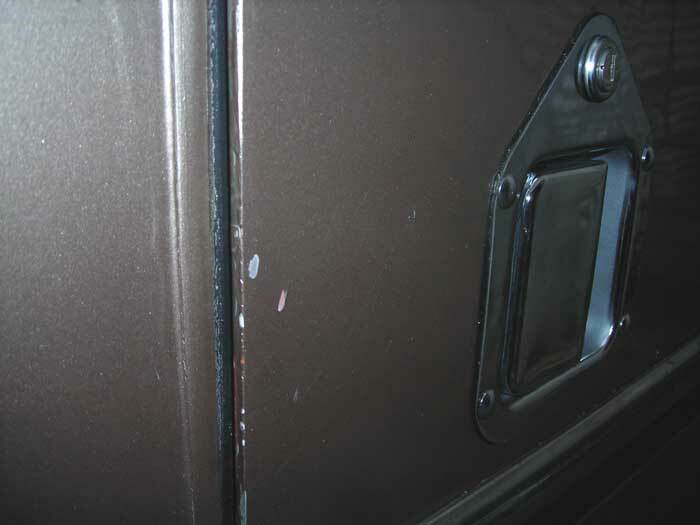 This is a common issue meaning usually that the door was in need of a recurve to match the lines of the body– usually so let’s see how that issue progresses. OK, first things first, the door has to come apart. 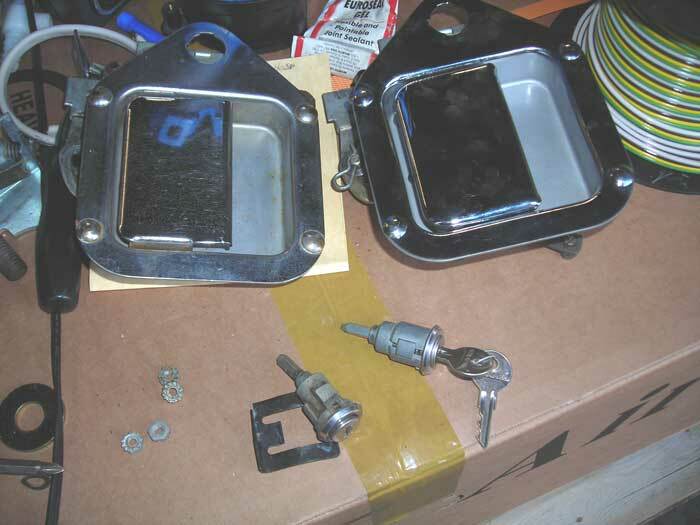 the upper and lower panels are taken off to access the metal latch plate fasteners Next the metal plate will be removed and the “Jesus clip” connecting the interior latch to the mechanism in the door is removes (please do not lose this clip!). Tom understands that details are important and in that his door lock was a bit sticky and hard to operate, we will replace the original outside latch and key lock with a new one , this is an elective option but hey, we’re there so why not. You can get rid of 35 years of scratches and wear. Yes, the latch and lock is a bit over $100 worth of hardware but like I said– we’re there now and the labor is the big deal. 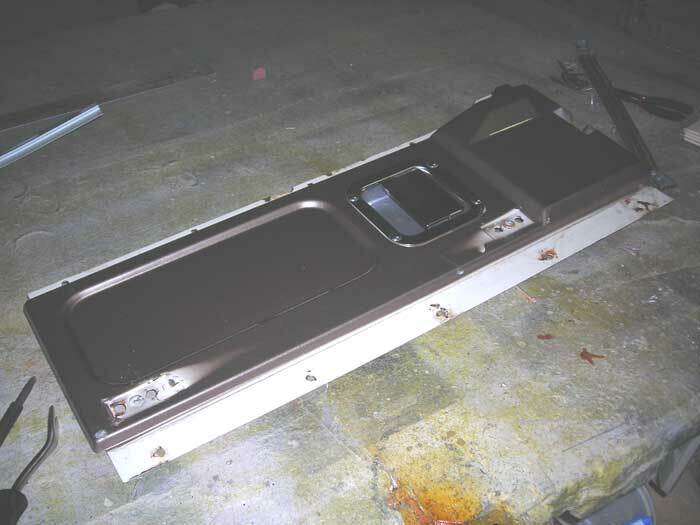 Next, we address the inside metal latch plate and cosmetically updating its look, , As you can see, the panel had never been actually taken off when it was painted before. There was white paint under the original strap. I mean you could not see it unless you looked but in that I looked– I had to do something about it! 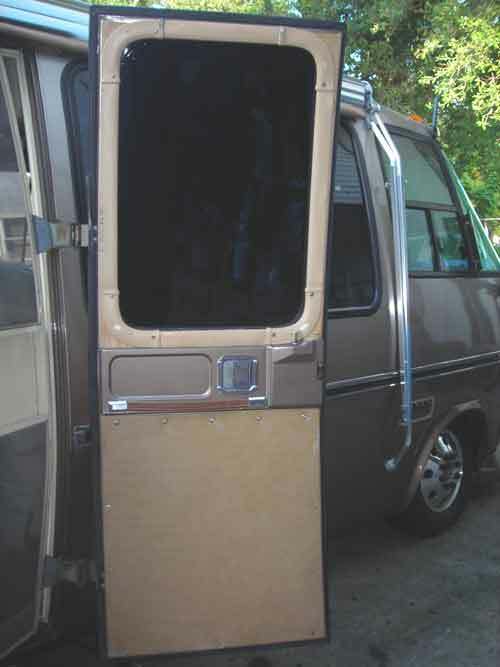 Breaking the panel down, I stretched the vinyl material used to build his new seats over the metal panel , wrapped the original strap in the stuff then reassembled the plate using a new interior latch again using the same theory as the exterior latch and installed it back onto the entry door Now– that’s what I’m talkin about! We’ve got something of beauty on the door now and it’s time to address the fitting of the door to the body. 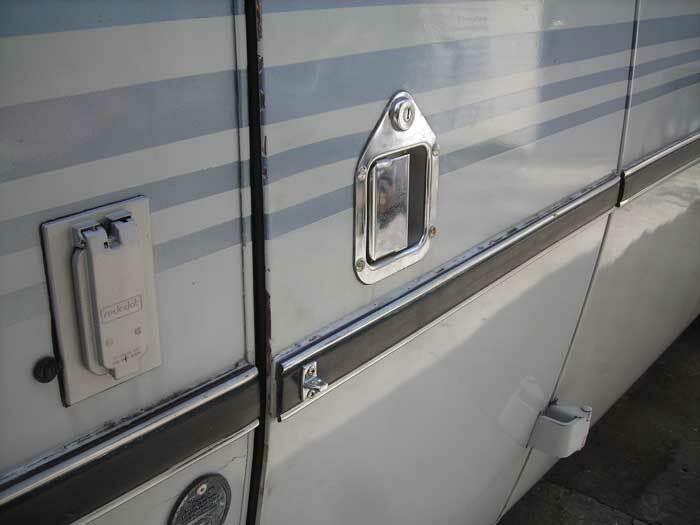 The door has 2 “lock positions”, one is easy to latch so in the middle of the night you won’t wake your neighbor when you slam the door then the second lock snugs the door up to the seal for a good tight fit. Tom’s door would not trigger the 2 lock positions— it would only stop on the first lock which left a decent gap at the middle of the door and the bottom of the door is standing out pretty proud! 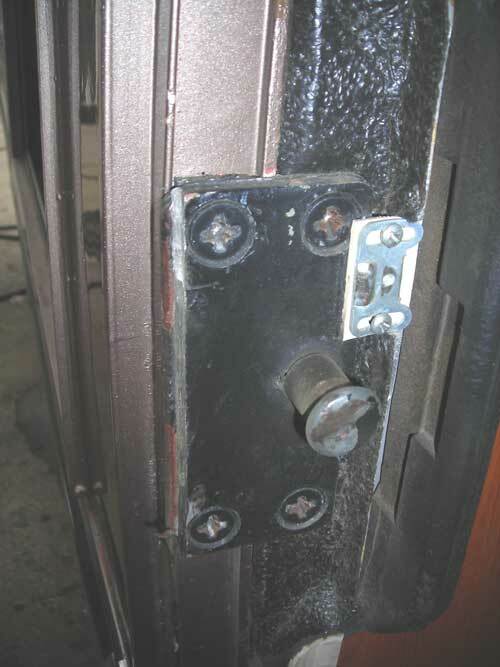 OK, let’s get the latch to hit both lock positions– only hitting the first position means basically the catch is not being triggered twice which means it is not travelling in far enough to make that second hit. 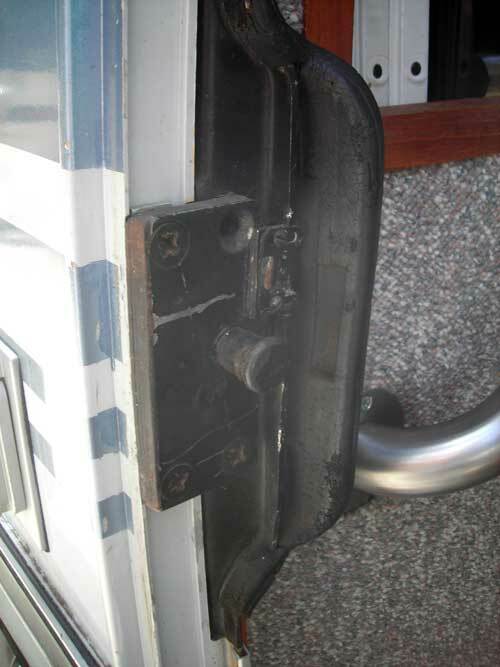 You can make the door come in further or bring the striker pin out to hit that second position and in this case with the Birch screen door sandwiched in the jam it is a better bet to bring the striker pin and plate out to let the catch hit the second lock position. 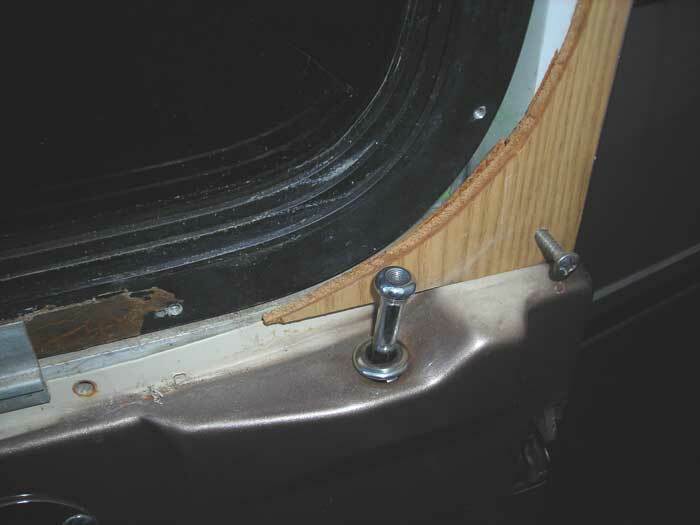 Taking out the 4 attaching screws (be careful to leave in one of the 2 outer screws in that they are threaded into a plate that will fall into the door if both screws are taken out together) you oblong the attaching hole to give adjustment to the striker plate. 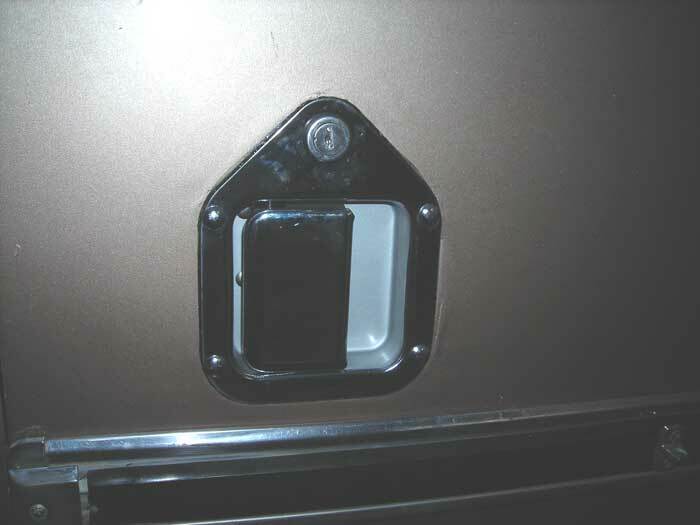 Then the front edge of the striker plate must be trimmed short to keep it behind the gasket mating level Bringing now the adjustment in and out I was able to have the door hit the first and second lock positions . But in bringing this in, the bottom of the door was still out– what gives? 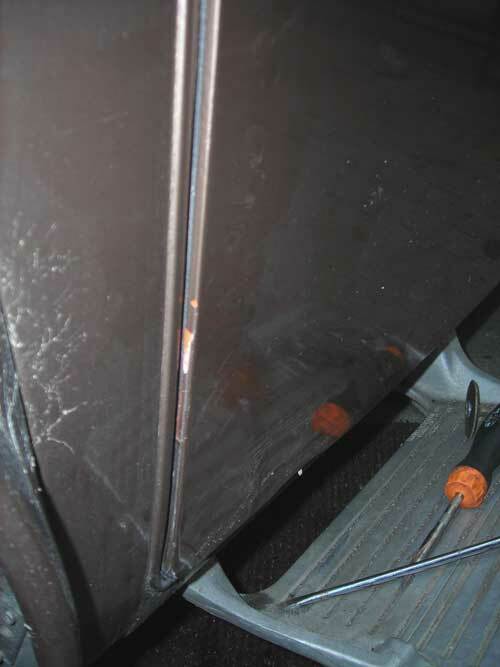 Look a little closer and you will find Tom’s problem– from under the door you can see that the outer skin of the door has broken away from the door frame and even though the frame is tight up to the jam, the door skin is flopping in the breeze! 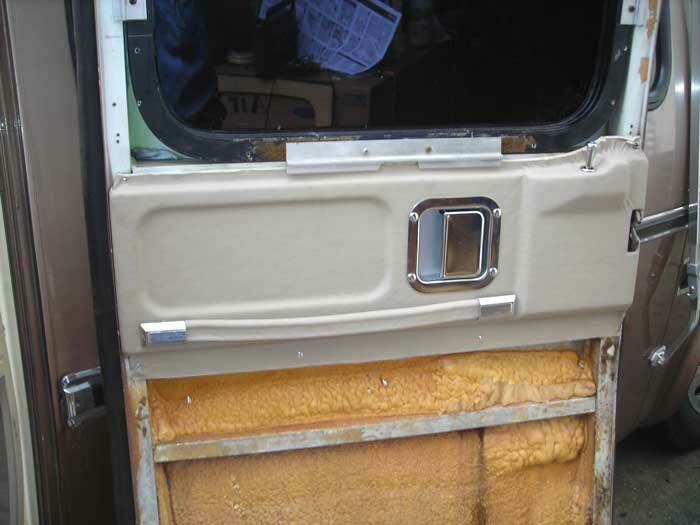 Well it’s not that bad but it is damaged but to repair that you will need to glue and rivet the door skin back to the frame and really that procedure will need exterior body fill and repair. 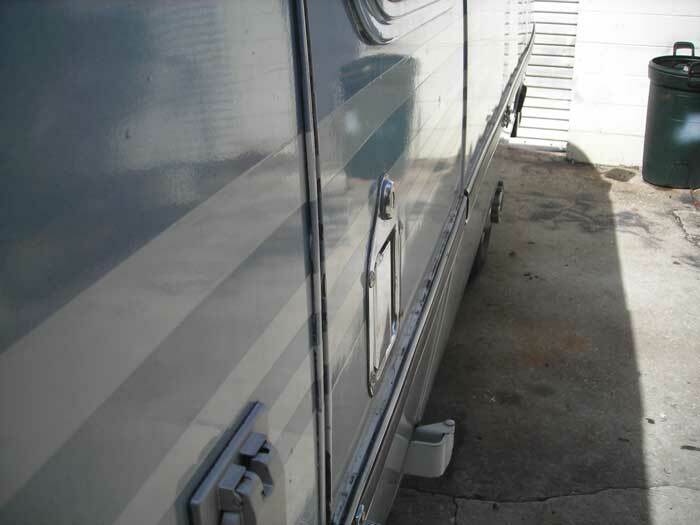 Tom was thinking about an exterior refinish at some point in the future so with the door frame now shutting tight, I think waiting till the body is refinished would be the time to repair the door skin delam issue. So there we are, Tom’s door did not need a recurving service, all he needed was a striker pin adjustment. 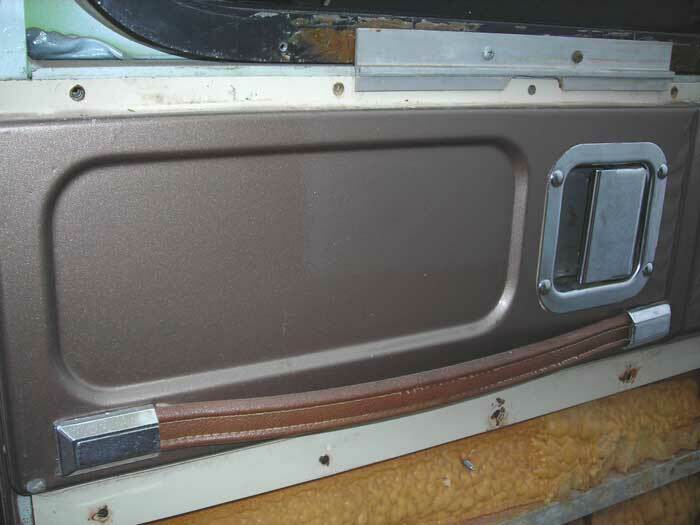 Now let’s get back to the cosmetic refinish of the interior door panels. 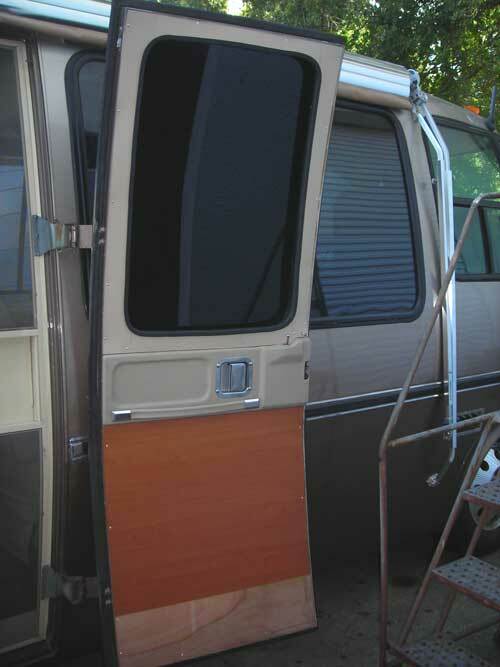 With Tom’s screen door, the interior of the door needs to be as flush as possible, the interior strap will have to remain tight to the plate and his window treatment consists of keeping the extremely dark tine for privacy. We can include a 1/2″ slat micro-mini blind custom fitting into the window frame but in this case we will leave what he has. 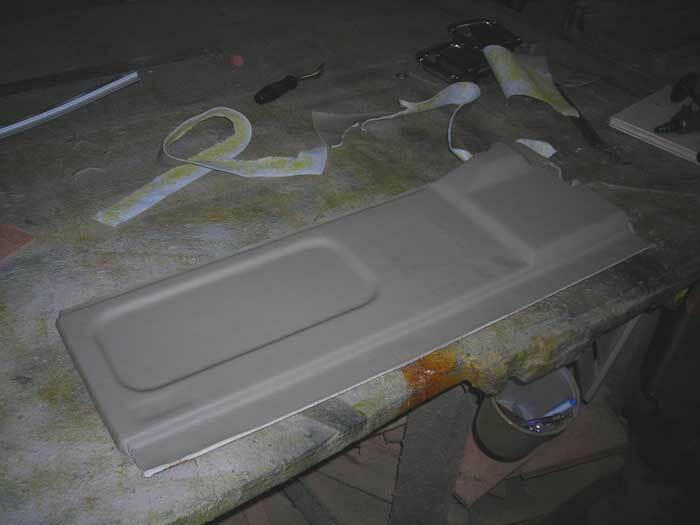 Next is to refinish the upper and lower panels in the new colors and materials of his interior. Ok, everything seems to be fitting well now, it’s time to make it pretty. 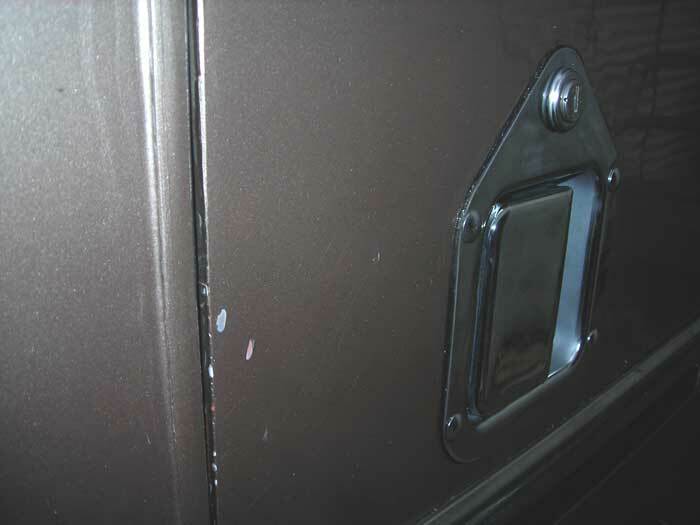 With the metal latch panel refinished and reinstalled with it’s new interior latch and a new exterior latch panel and lock assembly (there are a few finger smudges showing) , we are ready to make new upper and lower interior door panels. It has been said to me that I give away too moany of my refinishing secrets that have been learned over the years, it is ashame because I enjoy teaching others what I have learned but the truth is those things are why folks bring their coach to me for those special touches so I am unfortunatly going to have to fall short in showing you guys all of how I finish off this project. I will tell you to take your time, do things the best you can and if you just want it done– bring your coach on down, we’ll keep the porch light on for ya! Eric installed my window edge trim . 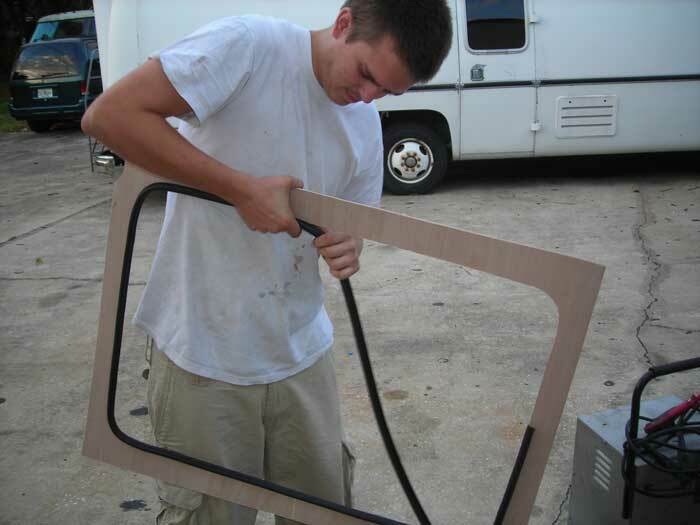 We do not use either original window trim treatments opting for this special “gimp” trim and recutting the surround panel. Take a gander on our “gallery” page and zoom in on some of the window treatments and you will see this finished product. If you are interested in refinishing your windows as we do, the material is $1.20 per foot, when you purchase the material I will tell you how to recut the surround panels and install this good looking trim system. So, “Wham-bam-alakazam” and we have Tom’s door looking pretty decent . The lower panel will have a carpet toe kick that will be of the carpet in the coach, all edge bound by Steve next week. 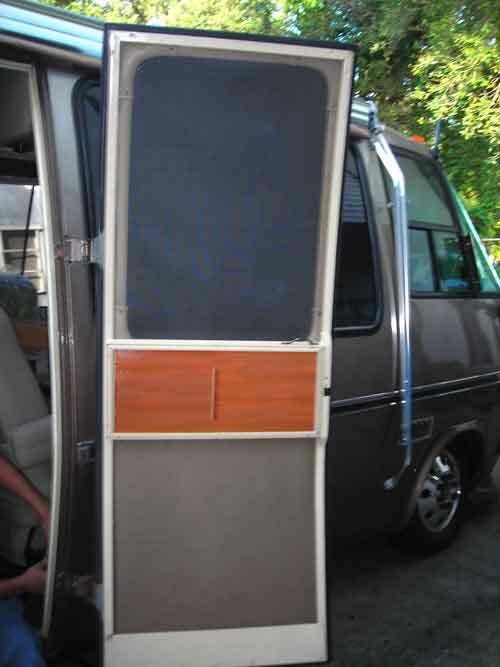 The woodgrain lower panel is the same material on his bulkhead walls and the upper window surround and the metal latch panel match Tom’s new seats . His original off white “Birch” screen door with it’s color keyed slider panels matches well to his interior wall and counter top color. Now, the door goes with his interior and I’m calling this door done. Oh and as a footnote, we had another coach on the lot with door issues. Ben’s door also would not close tightly. It was not closing to the second lock position. 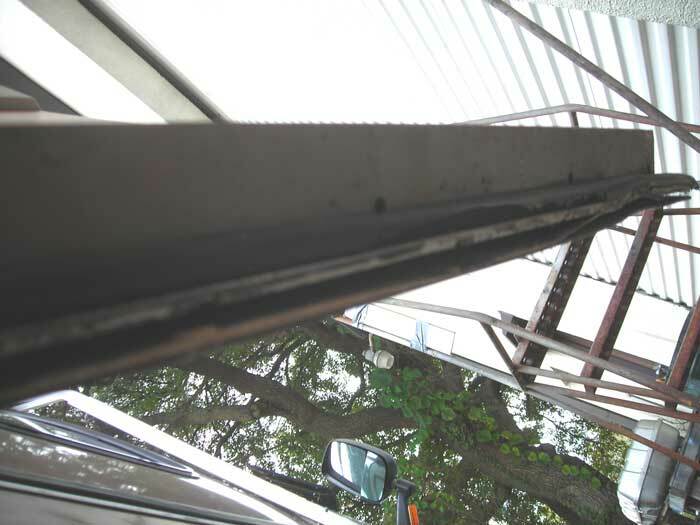 There are several issues that could cause this (door recurve, latch or striker adjustment, etc.). Feeling good after working through Tom’s door project, I went over to Ben’s coach to see what could be done. Just as with Tom’s coach, the first thing to check is the striker plate and pin Now Ben’s previous owner had ground down the leading edge of the striker plate but it was recessed a bit. Lostening the 3 attaching bolts (there should have been 4, one was missing) I was able to bring the striker plate out which brought the catch pin out, this should help in letting the catch hit the second lock position. 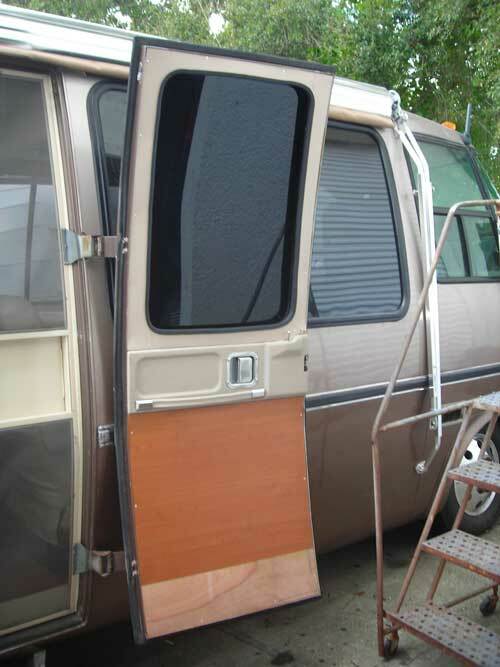 Ben also has a screen door , it’s one of the late model Ragusa units. These are a bit tricky to adjust and many times stands in the way of a tight fitting close. Adjusting a bit the screen door and the striker plate adjustment I took a test fit to see if I made any headway in the closing fit. Slam lightly and we had a first lock position which if you compare is just that much tighter to the body than it was before. Opening the door and giving it a bit harder close– “wham-bam” we have the second lock and what I see as a really nice tight fit . So with only a 30 minute investigation, we have a nicely fitting door. 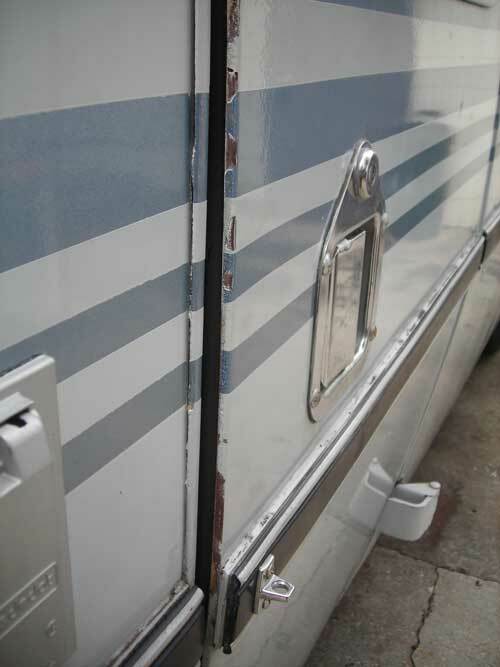 hey, they all don’t go this easy, Many times you will have hinge damage, improperly curved doors, interfering of the aftermarket screen doors or other issues. 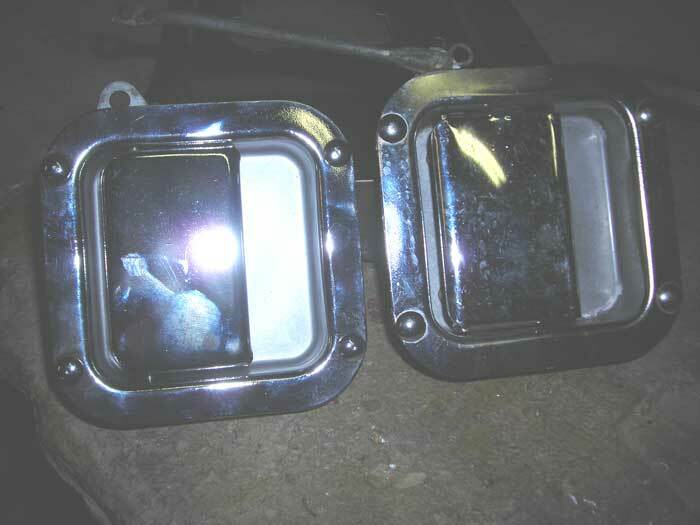 n these 2 coaches, careful investigation of the issues made the repair a quick and easy affair. Good luck with your problem. If you have questions, give me a call and if you want me to see what needs to be done, as they say “come on down”!